Arthur Gold (6 February 1917 – 3 January 1990) and Robert Fizdale (12 April 1920 – 6 December 1995) were an American two-piano ensemble; they were also authors and television cooking show hosts. Gold and Fizdale met during their student years at the Juilliard School. They formed a lifelong gay partnership and shared interests in music (forming one of the most important piano duos of the 20th century), travel, and cooking. It has often been said that Gold and Fizdale revolutionized the art of performing as a two-piano duo. While this may be a subjective statement, it must objectively be stated that they did commission and première many of the most important works for this ensemble in the second half of the 20th century, including works by John Cage ("A Book of Music" (1944) which is one of Cage's earliest experiments in using the prepared Piano), Paul Bowles, Virgil Thomson, Ned Rorem and many other important American Composers. They were fixtures in New York's artistic community, being friends with literary and cultural figures such as Truman Capote, James Schuyler, George Balanchine, Jerome Robbins, among others. In 1948, they were one of the wave of American artists, musicians and writers who took advantage of the first possibility since the end of World War II to freely travel in Europe. "The Boys", as they were called by their friends, arrived in Paris with a letter of introduction from Marcelle de Manziarly to Germaine Tailleferre of Les six who invited them to a lunch with Francis Poulenc and Georges Auric. This lunch ended with Auric and Tailleferre taking the score of Thomson's "The Mother of Us All", which Thomson had given as a gift, turning it upside down on the piano and having Poulenc singing all of the roles (including Susan B. Anthony) in nonsense English syllables which were supposedly an imitation of Gertrude Stein's Libretto while Tailleferre and Auric improvised a four-hands version of Thomson's score. After this memorable day, Tailleferre invited the couple to her home in Grasse to spend two months while she was writing her ballet Paris-Magie and her opera Il était Un Petit Navire. She wrote two-piano versions of both works and gave them to the duo as a gift. These manuscripts were later donated to the Library of Congress after the death of Robert Fizdale. Tailleferre later dedicated two other works to Gold and Fizdale: her Toccata for Two Pianos and her Sonata for Two Pianos. Francis Poulenc also wrote his own Sonata for Two Pianos for "the Boyz" (as he called them), a commission which was paid by their mutual friend the American Soprano and arts patron Alice Swanson Esty, according to Poulenc's correspondence. 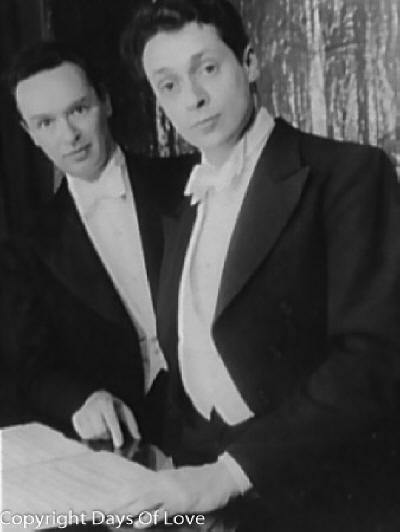 The duo also recorded a number of recordings featuring works by Les six, Vittorio Rieti, and other composers, as well as a series of Concerto recordings with Leonard Bernstein and The New York Philharmonic, including the Poulenc Concerto for Two Pianos, The Mozart Two Piano Concerto and Saint-Saëns's "Carnival of the Animals". Bobby Fizdale was born Robert Fish, the son of John and Rose Fish of Chicago. Had a brother Walter. Both Gold and Fizdale were of Russian Jewish descent. In the late 1970s, Arthur Gold began to have problems with his hands which made it difficult for him to perform, so the duo began to write biographical works, including "Misia: the Life of Misia Sert" (William Morrow 1981), "The Divine Sarah: a Biography of Sarah Bernhardt" (Knopf 1991). The duo also began writing food articles for Vogue magazine and began a television cooking show. In 1984 they published "The Gold and Fizdale Cookbook" (Random House 1984), which is dedicated to their friend George Balanchine, "In whose kitchen we spent many happy hours..."
In 1996, after the death of Fizdale, his estate donated the personal papers, recordings and other memorabilia to the Juilliard School, where they are kept in the school's Peter Jay Sharp Special Collections Room in the Juilliard Library  Gold and Fizdale are buried together at Oakland Cemetery (Sag Harbor, NY).